In 2017-18 our club introduced a Heading Policy in order to ensure heading techniques are being taught and applied using a safe, gradually-tiered, age-appropriate approach. To ensure consistency and maximum support for the safety of our players, and will be requiring that all of our team coaches complete a mandatory 30-minute Concussion Awareness Training Tool (CATT) course. For more information visit the Concussion Awareness and Heading Policy pages. 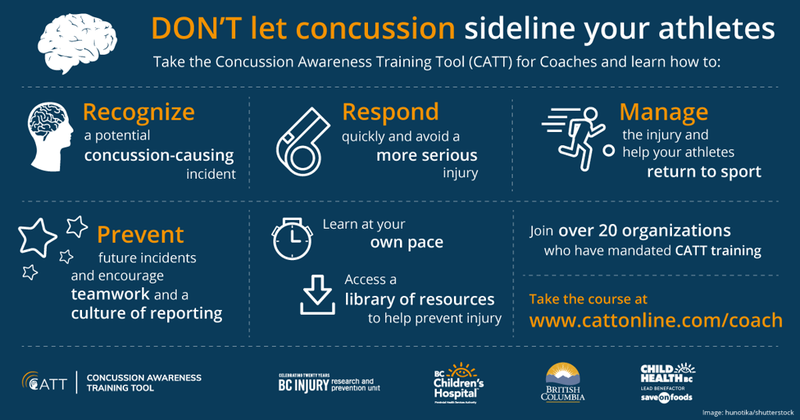 BRITISH COLUMBIA, March 13, 2019—Coaches and officials now have access to an updated version of the CATT e-learning module to support them in recognizing and responding to a concussion, as well as resources detailing how to manage an athletes’ return to sport. Prolonged rest until all symptoms have resolved is not needed for all athletes to return to sport. After an initial rest period of 24-48 hours, it is recommended that athletes may be reintroduced to light cognitive and physical activity so long as the activity does not make symptoms worse. Baseline testing is not necessary for post-injury care of concussion. Current evidence suggests that the widespread routine use of baseline computerized neuropsychological testing is not recommended in children and adolescents. This course was developed by Dr. Shelina Babul at BC Children’s Hospital in consultation with concussion experts across the country and provincial sport governing bodies. It is free-of-charge and available in English (French version to come in May 2019). Visit cattonline.com to take the new CATT for Coaches course and access sport-related concussion resources. In addition to the CATT for Coaches e-learning module, a booklet for Coaches was developed to aid with the overall management of possible concussion incidences. This PDF package contains an overview of concussion recognition, response and management, and several documents to assist coaches and trainers in providing comprehensive support to their athletes, such as a Preseason Education Signoff Sheet, an Incident Report, a Medical Assessment Letter, and a Medical Clearance Letter. To date, 17 sports organizations in BC have mandated CATT training for their coaches or officials.